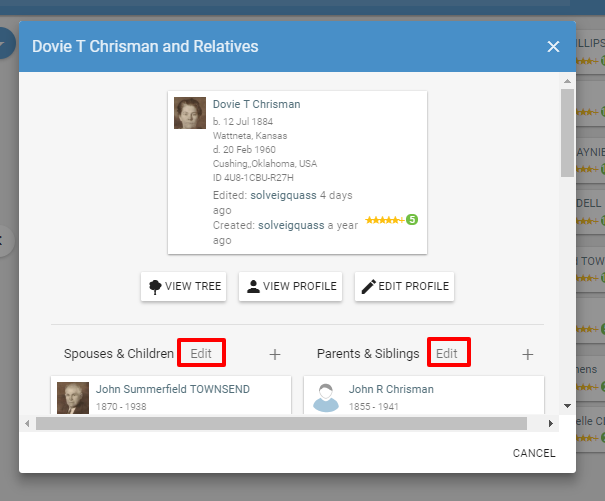 1- Go to the person detail window or page for the person you would like to alter the relationship for. 2- On the far right side of the screen click "edit" next to "Parents and Children" or Spouses and Children" where the edit needs to occur. 3- Click on the broken chain icon on the right side of the person bar. Click "OK". This will remove them from the family. How to move a child to a different parent within the same family. This is used when one of the parents is correct but not both. 1-Go to the person page for the correct parent for the person you would like to alter the relationship for. 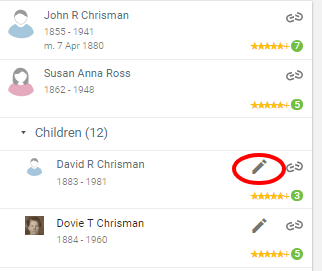 2- On the far right side of the screen click "edit" next to "Parents and Children". 3-Click on the double bars to the left of the person you would like to moves names. And drag to the correct parent. 1-Go to the person page for the child. 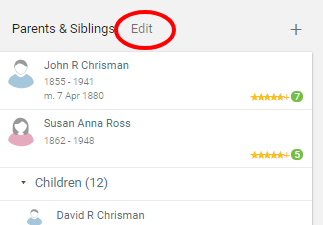 3-Then, go to the two parent family and click "edit" next to "Parents and Children"
4- Click on the broken chain icon next to the child's name you want to remove from both parents. 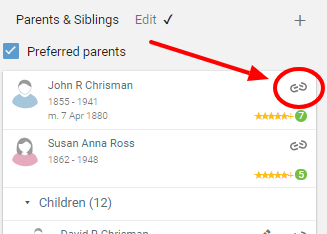 2- On the right hand side in either the "Parents & Siblings" area or "Spouse and Children" area click "Edit"
3- Click on the pencil icon next to the person you would like to declare the relationship type for. Relationship type examples are biological, adoption, family member, foster parents, guardian, step parent and unknown. 4- A pop-up box will appear. Select the correct relationship and click "Save" in the bottom of the box. Go to one of the adoptive parent's page. Add the adopted child to the family. Click on the "edit" link above the "spouses and children section." 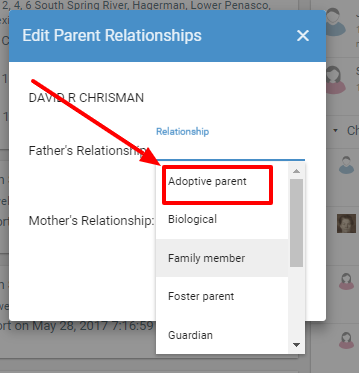 Click on the pencil icon next to the adopted child, click in the relationship field and choose the relationships with the parents.